As the largest Automotive Trade Show in the country, SEMA is unfortunately a trade-only event and is not open to the general public. 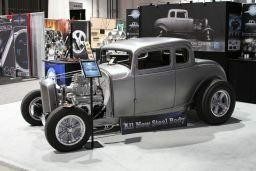 SEMA Show 2013 drew more than 60,000 domestic and international buyers. The displays are segmented into 12 sections, and a New Products Showcase featured nearly 2,000 newly introduced parts, tools and components. In addition, the SEMA Show provides attendees with educational seminars, product demonstrations, special events, networking opportunities and much more. If you’re involved in a Specialty Automotive business, Heacock Classic will see you in Vegas!